Wild products have had an important role in the livelihoods of both Aboriginal and non-Aboriginal peoples for as long as they have been present on the land. What is new, however, is the rapidity with which this sector is changing, including the volumes of species commercially traded, growth of interest in areas such as functional food markets and food security issues, and increasing attention to the sectors role in cultural maintenance and importance to wildlife. Population and development trends are also increasingly impacting the sector. There is no commonly agreed upon term for products collected in the wild, with wild collected products used inter-changeably with wild crafted products, wild harvested products, and wild grown products. Mushrooms, medicines, fruits, and florals come immediately to mind as the main focus of the wild products industry in British Columbia. These crops can provide for economic diversification in rural communities, can provide a sustaining or supplementary income for individuals and families, and can be culturally essential to First Nations, as well as providing important health and recreational benefits to rural and urban residents alike. Beyond these obvious resources lies an even greater value in the ecological services inherent in wetlands and the reparian zones adjacent to them: purification and supply of clean air and water, sequestration of atmospheric carbon, and productivity of soil. While initially looking at material products with a definable market and cash value, management of wild products invites us to consider the dynamics of the whole ecosystem as a diverse source of economically useful values and an essential part of the planet's life-support system. It is necessary to incorporate local and traditional knowledge to define what quality means, how to assess this quality, and how to assess a particular site for accessibility. This has been initiated with a number of species in north central British Columbia, and we have begun this process in Lake Country. Quality ratings have been developed and are also available on the web. The incorporation of standardized quality ratings will increase our understanding of the site characteristics required for high quality sustainable abundance. Effective management that involves multiple users and/or multiple uses will require novel institutional and governance arrangements. The majority of wild products remain unregulated throughout much of BC, however some community forests, woodlots, and private lands are exploring their options for management. Meaningful communication and inclusion of those who rely on these resources from the beginning of the planning process will help ensure efficient and effective solutions. Understanding of the supply side of the market for wild products has been growing, and corresponding work is starting to be done on the demand side. What do consumers know about wild products and why do they buy them? A Shop the Wild survey asked 220 consumers a number of questions about their interaction with, and understanding of, the wild products sector. They asked consumers how frequently they had purchased wild, organic and local products during the last 12 months. 203 people surveyed said they had bought local products including those who gave no response, while 192 and 159 respondents said they had purchased organic and wild products, respectively, in the past year. What is fascinating is how often these types of "ethical" or sustainable products were purchased: 74% bought local products and 56% bought organic products every week. Wild products were purchased less regularly: 11% every week, 20% every month and 41% every 6 months. Research in sustainable consumption behaviour (in general) suggests that wild purchases may be less regular because of lack of access, high prices, concerns about quality/efficacy, or doubts about sustainability. Documenting botanical knowledge, including which species of plants are named and used by different cultures and groups, is a large part of my work. It has led me to understand that what might be just interesting, vague stories to outsiders have a much more profound meaning to people who have intimate knowledge of the places and the characters mentioned. Every story has its own context, its own situation. Not only do narratives and conversations convey essential cultural knowledge and information, they reveal lessons and ethical approaches to relationships with other people and to the environment. Over the years I have become more and more aware of the important ties between ethnobotany and conservation, as well as the links between ethnobotany and ecological restoration – the art and science of recovering species and habitats that have been damaged by human activity. Far and away, supporting local producers was the most commonly chosen reason for buying wild products (by 100 respondents). Taste, sustainability, health benefits and encouraging biodiversity were the other reasons, with 50 "votes". The interesting overlap between wild products and local products identified in both the question on frequency of purchases and the reasons for purchasing wild products was also evident when we asked people to give their opinion on the statement "Products produced and harvested from the wilds of BC supports our economy and our communities". Over half of all respondents strongly agree with this statement, with a further 93% believing that wild harvesting makes a positive contribution to local communities. Findings from our focus groups also confirm this overlap between wild and local. Consistently, participants saw the opportunity to build relationships with local producers, and to contribute to the creation of a thriving local economy, as primary motivators behind purchasing wild products. Wild products are a rapidly expanding part of a wider ethical and sustainable products market. The evidence shows that consumers are less regularly engaged in the "wild" segment of that market than with local or organic products. At the same time, the impact that wild products have on the local economy is extremely important to their decisions to purchase wild products. There is a clear marketing advantage to linking wild products to small scale localized sustainable production. Bringing wild products into the mainstream economy is a challenge. Many of the factors that affect harvesting, marketing, and maintenance of wild products are hidden in unrecorded traditional uses by First Nations, in the informal and underground economy of subsistence harvesters, in recreational pursuits, and in scientific obscurity. What evidence we have for the value to society of wild products is not yet enough to make a case for attention amid the clamour arising from traditional resource industries and agribusiness, but that is not a reason to ignore the great potential of treating our environment as a richly variegated resource that will benefit from an equally variegated approach to ecological management. It is both possible and profitable to modify traditional approaches to landscape management in order to foster ecologically sound development of a new high-potential economic sector. Collaborative design, such as we are practicing with the Okanagan Wetlands Regeneration Alliance, is the key to managing ecological resources for the diverse interests in the wild products sector. We have before us an opportunity to follow the emerging insights about wetlands and their potential for a wide range of natural products and services with practical demonstrations of co-design and co-management. The current circumstances of our forest and agricultural industries, the resulting need for economic diversification, and the global need to maintain the natural functions of the ecosystems demand that we rise to the challenge. Below we examine two of the plants that are part of the study group we have conducted in the wetlands landscape in Lake Counry, and intend to further examine their potential as wild products. 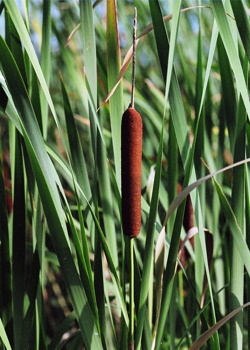 Typha is often referred to as Cattail, and are perhaps the best known of the wetland plants. Yet very few people have a respect for their incredible ecological and wildlife value. Typha has a vast number of uses both as food and as building materials. Euel Gibbons claims that for the number of different kinds of food it produces there is no plant, wild or domesticated, which tops the Typha. All parts of this plant are edible: the rhizomes, young shoots, young stalks and pollen. Sprouts are eaten raw or cooked lightly steamed and tossed in butter or pureed with cream as an excellent substitute for asparagus. The male flower, when just developing buds and emerging from the sheath, can be peeled and boiled. The buds are then nibbled from the stem and the stem discarded. Later, the pollen from male flower can be collected and mixed with flour for baking. The pollen adds nutrients as well as producing breads and pancakes with vibrant yellow hues. The rhizomes can be collected throughout the winter quite easily by reaching into the muddy ground of the shoreline and pulling them apart. They can be steamed or boiled or cut in sections and allowed to dry, the rhizomes can be ground into flour. This flour is very nutritious, with far more nutrients than corn, rice or wheat and the bonus of a high protein content. Gene Logsdon suggests growing Typha commercially because they are such aggressive growers, they are so nutritious and they yield a phenomenal amount of food. He argues that one acre of cattails can produce 30 dry tons of flour, leaving ample rhizomes for the next year's growth. In comparison, wheat offers an exceptional harvest at three tons per acre. First Nations people used Typha extensively. Burdock is a thistle plant native to the Old World, although several species have been widely introduced in temperate climates worldwide. It is often found in disturbed habitats, roadsides, vacant lots, and fields. It is a major wild food source and has long-stalked wedge-shaped, wavy edged, toothless leaves that looks much like Rhubarb. Burdock leaves are roughly two feet long by one foot across and are white and fuzzy underneath. olk herbalists consider dried burdock to be a diuretic, diaphoretic, and a blood purifying agent. The seeds are used in traditional Chinese medicine, under the name niupangzi. 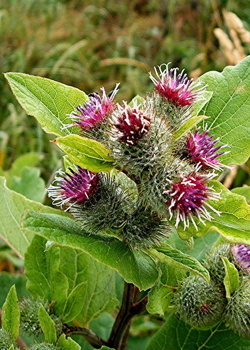 Burdock is a traditional medicinal herb that is used for many ailments. The invention of Velcro is attributed to Burdock's influence. There are two types of burdock in the Okanagan-Similkameen, both of which are European biennials. Common burdock (Arctium minus) is the most frequently occurring species, growing 1 to 3 metres in height. In the Okanagan, burdock is common in farmyards, along fence lines, roadsides, as well as riparian areas with moist, fertile soils and high nitrogen content. As with other non-native plants, burdock has an advantage over our native plants because it lacks enemies, and therefore has a competitive edge. When the native plants are displaced, the animals that feed on them are forced to move elsewhere to find food, which diminishes their habitat. Effective control of burdock is highly dependent on stage of growth. During its first year of growth, the top 3 to 4 inches of the roots must be dug-out. The taproot functions to store nutrient and energy reserves. If plants have gone to seed, they should be carefully clipped and bagged, then taken to the landfill. Composting will not necessarily kill the seeds, so plant material should be buried.